The Blind Guys originated in Denver, Colorado in 1993 as a professional installation service for both commercial and residential window coverings. Over time, our reputation, knowledge and attention to detail helped us become the leading installation company and largest distributor of Hunter Douglas products in the Denver area. As time passed and our product knowledge increased, we became involved in sales. We were now able to both offer quality window covering products and provide professional installations. Since 1993, we have continued to attend window covering workshops and seminars provided through national training. Our dedication to product knowledge and professionalism has earned The Blind Guys several professional certifications. In 2004, The Blind Guys moved its headquarters to Tucson, Arizona. Since then we have shown our dedication to provide Tucson and surrounding areas with the same quality products and services we offered in Colorado. Because of our history and dedication to the industry, we became a Hunter Douglas Showcase Priority dealer in 2008 and a Hunter Douglas Gallery dealer in 2014. With this distinction, we are able to offer the exclusive Hunter Douglas Alustra Collection and the exclusive Hunter Douglas Right Choice Promise™ program. The Blind Guys are dedicated to providing you with quality products, personalized service and competitive pricing. We provide you comprehensive service for all your home decor needs including initial design consultation, product selection and professional installation. Your order is personally expedited by Mike Levy, President and Owner of The Blind Guys. Your complete satisfaction has always been our priority! Tom first joined The Blind Guys design team in the fall of 2018. Bringing a wide range of experience, Tom's 35 years of design/Build expertise in both Home & Commercial construction allows Tom not only to guide you through design & color choices but also assures that you get the correct blind in the correct opening for its application. This cross of expertise allows for value engineering assuring that the Blind Guys deliver the BEST value for you dollar. "After several window covering companies I contacted the Blind Guys (1. Comparison shop and to get the best deal for my money. After visiting their store I opted for an in-home presentation. Mike, the owner arrived on time. He brought every conceivable Hunter Douglas Product sample for our perusal. With his suggestions concerning room darkening and energy savings my wife and I made our decision. It was a most enjoyable presentation. Mike really knew his product. After taking measurements Mike told us the expected installation date." 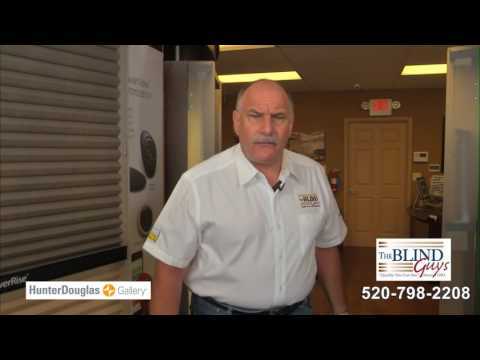 - Marty L.
We're your Hunter Douglas gallery, specializing in custom window treatments. We offer blinds, shades, plantation shutters and more! 1. Our sales team will help you solve your window covering needs by recommending the best possible solution for each individual window. 2. Our installers are professionally trained and will explain and demonstrate all operating systems on each window covering product you purchase. maintain all products purchased through The Blind Guys. 4. Our team will review all manufacturers’ warranties and fully explain any questions you may have. The Blind Guys will NOT ask for the final payment until you are completely satisfied with the products(s) you have purchased. We personally guarantee that after installation you will be completely satisfied with our products and services and will happily refer us to family and friends.